Northern Ireland's Graeme McDowell came out on top of the controversial 36-hole Open qualifying at Sunningdale. McDowell carded 67, 64 over the Old and New course to head the list of 16 out of 120 players who earned the right to tee up at Carnoustie from 19-22 July. England's Nick Dougherty, Ross Fisher and Peter Baker and Scot Alastair Forsyth were also among the qualifiers. But controversy reigned as eight players were told to replay a hole because of a difficult pin position. On the 156-yard par-three 4th on the Old Course, Ricardo Gonzalez took five putts, Edoardo Molinari and Alexander Noren four-putted and Brett Rumford three-putted from two feet. His second putt was from 35 feet. The players were taken back after the end of their rounds and Gonzalez, who carded a triple-bogey six first time, parred the hole for a 67. But Sweden's Fredrik Andersson Hed had to wait until almost 2000 BST before discovering that the farcical scenes just after 7am had not cost him a Carnoustie spot. Andersson Hed initially parred the hole but four-putted for a double-bogey the second time. His 66 became 68 but he added another 68 in the afternoon to scrape into a qualifying position. "I think the European Tour should do the pins," said Andersson Hed. 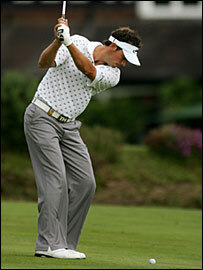 "Every time I've played in an event run by the R&A there have been one or two that were barely playable. "I didn't speak to the championship chairman, but I spoke to a few others and hopefully he got the message." Tournament chief Martin Kippax accepted total blame for the original pin placing. "I chose the pin positions because of the weather we've had and the forecast we had for today," he said. "I was made aware by a referee on the course that we had a potential problem. "I went out and saw that it was in an unplayable position, so after consulting with various people, certainly the European Tour, I suspended play and moved the pin position. "I admit it was a mistake and the responsibility lies on me and me only. One option was to start again completely, but we are on a tight schedule with 36 holes in one day." The 27-year-old McDowell finished nine under, two shots better than Swede Peter Hanson, Miguel Angel Jimenez of Spain and Dougherty. 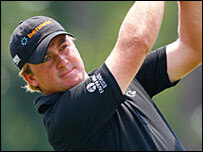 "I think I have the right mind-set for these qualifiers," said McDowell. "Some of the guys go out and try to play very aggressively, I play very conservatively. "I try and take my birdie chances when I get them. You need a lot of mental stamina to get through these 36-holers and I feel like I'm in the top 25% in mental stamina." Among those who failed to make it through were last year's Ryder Cup captain Ian Woosnam, but the Welshman was happy to be playing again as he battles post-viral fatigue syndrome. His last competitive round was an opening 77 in the Irish Open in mid-May but the 49-year-old carded rounds of 69 and 71 for a level par total. "I got tired the last nine holes. I just collapsed, but I got round," he said. "My feet are aching, my legs are aching. I'm knackered. But at the Masters I could only walk about 150 yards because I was in spasm." Woosnam, who pulled out of the Masters in April, has still to earn his first cheque of 2007, but feels well enough to enter this week's European Open and next week's Scottish Open. Each event offers one spot at Carnoustie, but it is only available to someone finishing in the top 10. He added: "I've mostly been playing in a buggy the last couple of months. I'm only 60-70%, but at least I know what it is in. I got a virus in Asia and it took me over the top. "I've basically got to rest. I've bashed my body for 30 years and I've just got to eat properly not drink too much - very difficult. "People have taken 10 to 15 years to get over this, but hopefully I can play every week now." Jean van de Velde, who lost from three ahead with one to play at Carnoustie in 1999, was not in attendance after withdrawing because of a mystery illness.